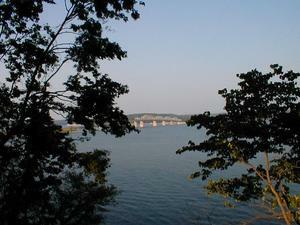 The Land Between the Lakes is a U.S. Forest Service maintained National Recreation Area located between Lake Barkley and Kentucky Lake in western Kentucky and northwestern Tennessee. 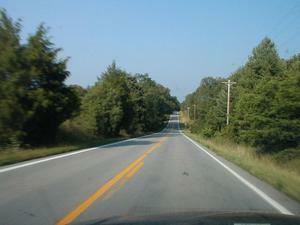 A road known as "The Trace" runs north-south through the park, and US 68/KY 80 passes east-west through the park. 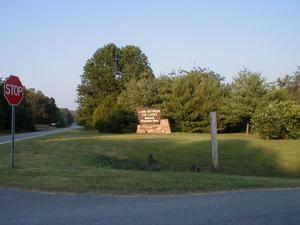 The Between the Lakes Canal, a canal between the two lakes, bounds the northern edge of the park. 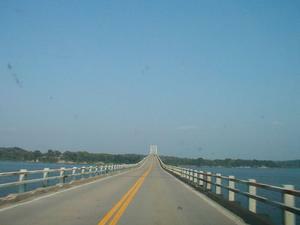 The Trace continues north as KY 453 and crosses the canal via the Between the Rivers Memorial Bridge. 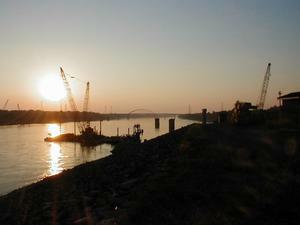 These pictures were taken on July 20, 2003 by Jeffrey Carlyle. 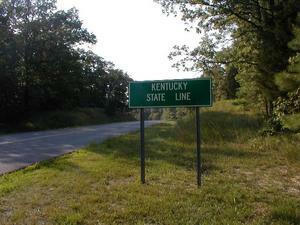 Description: Entering Kentucky on "The Trace." 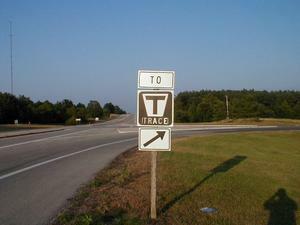 Description: The intersection between "The Trace" and US 68/KY 80. 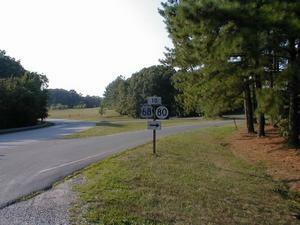 Description: Entering The Trace from US 68/KY 80. 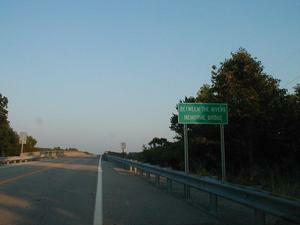 Description: Exit from The Trace to US 68/KY 80. 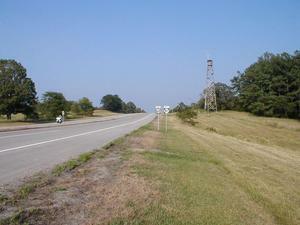 Description: Looking east on US 68/KY 80 at The Trace. 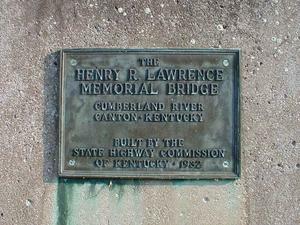 Description: Plaque honoring the Henry R. Lawrence Memorial Bridge carrying US 68/KY 80 over Lake Barkley. 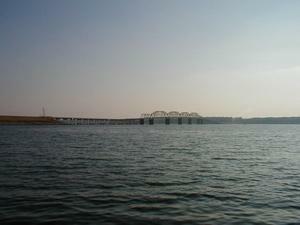 Description: The Henry R. Lawrence Memorial Bridge carrying US 68/KY 80 over Lake Barkley. 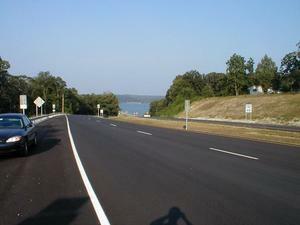 Description: The end of the recently completed four lane highway on the approach to the US 68/KY 80 bridge over Kentucky Lake. 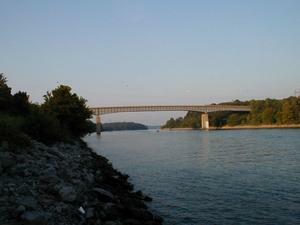 Description: The US 68/KY 80 Eggner's Ferry Bridge over Kentucky Lake viewed from Kenlake State Park. 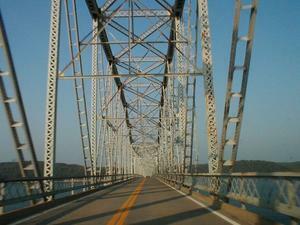 Description: Approaching the US 68/KY 80 Eggner's Ferry Bridge over Kentucky Lake from the west. 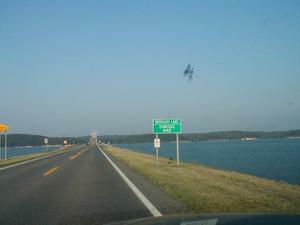 Description: US 68/KY 80 Eggner's Ferry Bridge over Kentucky Lake viewed from the Land Between the Lakes. 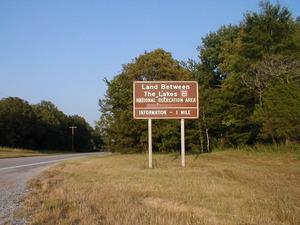 Description: Western entrance to the Land Between the Lakes National Recreation Area on US 68/KY 80. 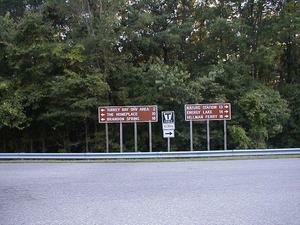 Description: The words "Tennessee Valley Authority" have been removed from this sign notifying travelers that they are nearing the visitor center. 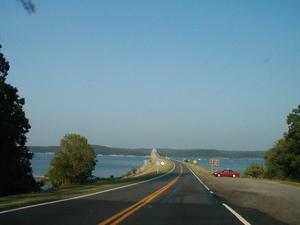 Description: A typical section of US 68/KY 80 through the Land Between the Lakes. 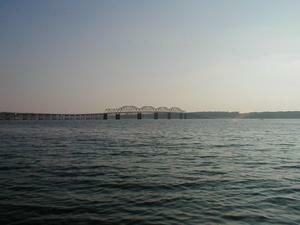 Description: The Between the Rivers Memorial Bridge over the canal connecting Lake Barkley and Kentucky Lake. 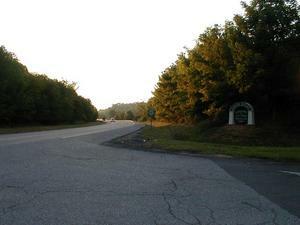 Description: The Trace continues north from the park as KY 453. 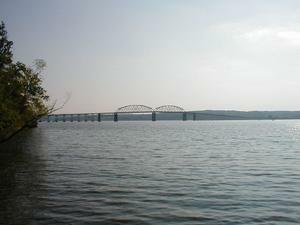 Description: "Between the Rivers Memorial Bridge"
Description: Looking from Kentucky Dam towards I-24's suspended arch bridge over the Tennessee River. 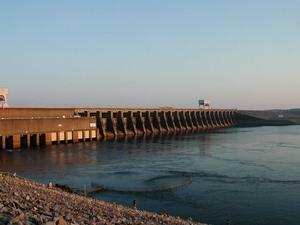 Description: Kentucky Dam. 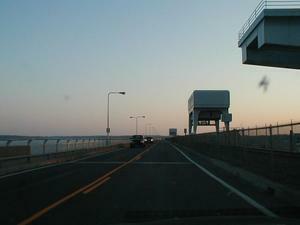 US 62 and US 641 traverse the rim of the dam. 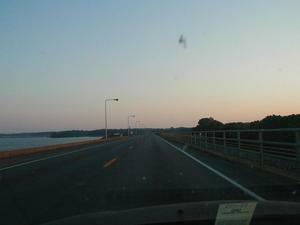 Description: Heading west on US 62/US 641 over the Kentucky Dam.